Change monitoring software has something that's long been desired in the OpenStreetMap community - the ability to easily see what changes have been made in your areas, and by who. I've been excited to see this week that it's finally come to fruition in the form of OSM Mapper from ITO World. Using this product you can set up one or more areas to monitor and analyse in a variety of ways. You can even establish RSS feeds to get alerts when other people make changes within areas of interest. You can also generate beautiful images to download and post anywhere as (CC-by-SA). ... plus all sorts of mapping products that highlight changes over time, changes by contributor, etc. I've been trying it out this morning to try and identify people who have recently contributed to the OpenStreetMap dataset of the Isle of Man, to try and make sure I don't give anyone a big shock when importing the new dataset from CloudMade, and hopefully to encourage others to help out once it's imported, to identify if anything is still missing. I have to say I've been pretty impressed at how well it works, and how quickly I've identified the major recent contributors and where they've been editing. Did you know that you can list your business for free on Google Maps and have it highlighted to people who are searching the map for businesses like yours within a certain area? 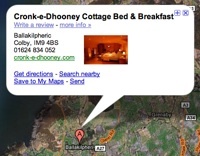 When I was building the Cronk-e-Dhooney Cottage B&B website a few months back, I was looking for ways to promote it. I added it to TripAdvisor to give it some visibility in the world of travel (and it's recently had its first glowing review) and then tried to add it to Google Maps using the Local Business Center. Trying to add it, I stumbled when it came to entering the address (which doesn't have a street name, and has a Manx postcode, which wasn't recognised by Google). Without a working address, there wasn't a chance of getting it listed. When I saw today's release of Google Maps for the Isle of Man, I thought I'd give the process another shot this evening, and try once again to add Cronk-e-Dhooney Cottage to the map. This time it worked much better (though not painless, as it still didn't like the postcode) and I've managed to get the information (and a couple of the photos I could get it to accept) onto the map. For the extended profile that pops up on the map, you can add photos and a wealth of information about your business. Now, do a search for bed and breakfast in the Isle of Man and you'll see the cottage come up in pole position. With free publicity like this, can you afford not to have your local business on the map? Tip: When adding the address, type it all out except for the postcode, click the link to change the location of the pin on the map, move it to pinpoint your property, and only then add your postcode. That's the only way I could get it to accept the address. Read more about Is your business on the map? 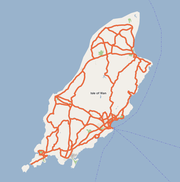 It's taken quite some time, but it's great to see that Google Maps now has a map of the Isle of Man to go with the imagery they added a little while back. Thanks Google! Just one day after I write about CloudMade announcing that they are donating their map of the Isle of Man to the OpenStreetMap project (see my post from yesterday), I notice today that Google Maps has added the Isle of Man to their list of places they have map coverage for (though no official announcement I can see on their LatLong blog as of yet). I had my suspicions that there may have been an imminent release of maps for the Island when I noticed that it wasn't possible to add map data on the Island through their new MapMaker tool that allows you to add your own data to unmapped regions. 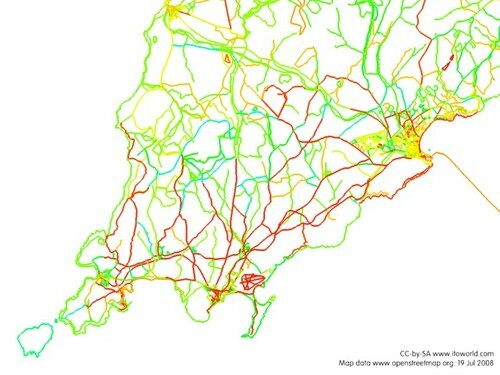 It's a shame that this data isn't editable like the CloudMade data that I'll soon be importing into OpenStreetMap though. Zooming into Castletown for a quick close-up look, I've already spotted an error (typo) in the naming of a road: check out Abrory road (should be Arbory Road) running into Castletown. If that was an error in OpenStreetMap data, it'd be a simple job to go in and fix that up so other users could benefit from correct data. Update: In some places, it's just plain wrong, e.g. this main road in Ballasalla (A34) that has been re-routed down a footpath before joining up with itself again. After a long wait, Google has updated their aerial imagery to include high resolution imagery of the Isle of Man. The imagery is available through both Google Maps and Google Earth. You can now explore the Island's towns (e.g. Castletown, Douglas or Ramsey), glens (e.g. Silverdale Glen, Glen Helen and Glen Maye), historic monuments (e.g. Lady Isabella or the Laxey Wheel, Corrin's Tower on Peel Head, Peel Castle, Castle Rushen in Castletown and Derby Fort on Fort Island, Langness) and the only mountain (Snaefell) or anything else that can be seen from above. Unfortunately there still isn't any name data, so it's much easier if you know what you're looking for when exploring. Update: I see from the Isle of Man Newspapers website - Improved Isle of Man images on Google Earth - that the imagery being included in Google's database is dated 2006 and is the result of "months of negotiations involving the Department of Local Government and the Space Commerce Division of the Treasury." Thanks to a blog post I wrote a couple of years back, I was recently invited on a tour around the new Heathrow Terminal 5 before it opens to the public later this month. More on the tour in a later blog post (also listen to the This Week in London podcast for a walkthrough of the new terminal ). To get to the British Airways headquarters for the tour on Monday, I had typed the postcode (UB7 0GB) into the Transport for London Journey Planner website and found a set of connections that should have taken me there with plenty of time to spare. It did strike me as a little weird that the headquarters were situated so far from the airport itself (see the same location on Google Maps), but didn't think too much more of it as mt flatmate and I started on our journey to Uxbridge and the end of the London Underground Metropolitan line. Walking through a residential estate and arriving outside the Uxbridge Royal Mail delivery office, I did start to wonder where the British Airways office was. Named Waterside, it was bound to be next to some water, and of course there was a canal flowing through to lull me into a false sense of security. With desperation growing, we walked into the delivery office to inquire there. As I walked towards the counter it suddenly started dawning on me that BA had perhaps had their mail directed to the delivery office. The Royal Mail guy confirmed this, saying something along the lines of "They do have a PO Box here, yeah. Did you follow your TomTom to get here?". We were already running later than planned, and it turned out we were miles away from the actual headquarters bordering Heathrow (see map). Luckily we managed to get a taxi and caught the tour group just as they had given up hope on us arriving and were starting to head off. Postcodes can be a great way of finding a location, with mapping websites and journey planners typically having knowledge of postcode locations across the whole of the UK. That said, how can they be useful considering their sole purpose is not for telling everyday people where something is, but instead for telling a postal delivery worker where to take the mail? How do you know when a postcode is going to relate to a building (often for large users such as businesses, schools, hospitals, etc. ), a street (as is often the case), or somewhere completely unexpected such as a postal depot? Perhaps this is where the user-generated databases of postcodes can start to step in. I've added the postcode UB7 0GB to the New Popular Edition Maps website that allows people to add postcodes they know the location of, as long as they can work out the location from 1940s Ordnance Survey maps. The database of postcode locations is then available to anyone without restriction. A colleague of mine commented the other day on the 3D buildings that Google had introduced in St Paul, Minnestota and sounded suitably impressed. It reminded me of when I first heard about the introduction of building outlines, and then the extrapolation of them in some places to give a 3-dimensional effect. Since then I had intended to give a quick tour of the way Google represents places around the world using differing cartographic styles in different countries, largely to reflect the map conventions that people are used to in those places. The Chinese maps (available through maps.baidu.com, Google's Chinese subsidiary, not through other Google Maps portals) show business locations such as KFC, with a handful of other markers used to highlight different services, each named respectively. There are very few building outlines included and, as in most places, the streets are simple lines, many of which appear to be unnamed. Update: I confused Baidu (not a Google business) with Ditu, the Chinese version of Google Maps. The maps of Shanghai are quite similar to the Baidu ones I described, though seemingly without commercial entities like KFC on there. The maps of downtown Tokyo seem to be very pedestrian-centric, with prominent stores and landmarks being represented, sometimes with a logo (e.g. 7-Eleven and am/pm stores) and sometimes with a red dot and the name of a building. Some of the larger buildings are depicted in 3D though for others, just the outlines are included. In addition, streets are shown not just as lines, as they are in most other Google cartography I've seen, but actually as they are laid out on the ground, with pavements and crossings clearly marked. The downtown area of St Paul, MN is covered by 3D buildings, including all of the skyways that link together to form a vast indoor network above the ground. Further from the centre of the city, there are very few buildings to be seen. Other than this network of pedestrian walkways, the rest of the map could be considered very vehicle centric, with no public transport information (surely there are some bus stops at least?). Downtown Manhattan Island in New York has a more extensive coverage of 3D buildings and also has public transport information included, with both stops/stations and the services that run through them. With so many tall buildings in the downtown area, especially around the central business district, it can be difficult in places to make out roads in between buildings. Google has been extending its transit information to all sorts of new places, providing easy access from within their maps wherever possible. London has no building outline data, though Google has tried and failed to obtain the the information. Google and the Ordnance Survey never reached an agreement, so the excellent data sources that were built up from OS data as part of the Virtual London project aren't (yet) available to be used outside of academic circles. The London maps also show transport information, but few other landmarks (Covent Garden Market being one). Moscow's map depicts building outlines and their (street) numbers as well as Metro stops, though there is no embedded transport information there as of yet. One thing I find interesting about Moscow is the delineation caused - presumably - by combining different datasets, showing stark differences in the levels of foliage in and around Moscow compared to its surrounding areas. Is that due to different ages of datasets, an actual difference in coverage up to a physical boundary, or a desire to show Moscow as being a greener city than it actually is? (Having never been there, I'm not sure which of those is most likely). Who will contribute to People's Map? It seems the People's Map have launched their online editor today, taking their mapping service from just showing their own pre-created maps to actually allowing people to edit the maps themselves and help them build up a map that they can sell. You agree that the information you submit may be freely used by the People's Map in perpetuity. You will have no rights over the information once you provide it to us. It will be really interesting to see if people actually take People's Map up on their offer of mapping the British Isles for them without being able to use that data until they pay for it. At least with OpenStreetMap data, you're free to do what you like, as long as you credit the project and make the data available again to others wanting to do the same. Oh, and it's all free. Can the People's Map add extra value to what OpenStreetMap is already doing, by putting their revenue to good use, perhaps using it to validate the crowdsourced data? Read more about Who will contribute to People's Map? Tomorrow I'll be traveling down to Barcelona with my colleagues for this year's DrupalCon. Much like last year's OSCMS Summit (which basically turned into a DrupalCon) and DrupalCon Brussels it will be a great chance to meet up with other Drupal developers and users, see what others are using the platform for, join in discussions about its future and hopefully promote some of the pieces that we've been developing at work or have sponsored. I'll hopefully be doing a lightning talk on the use of Drupal as a GeoCMS - if there are enough people interested - perhaps demonstrating some Google Earth integration through the KML module, GeoRSS integration, or even WFS integration (if I can get it working before then). If you're going to DrupalCon and are interested in the geo aspect of Drupal (or geo in general), let me know or catch me there - I'll be the one with the 'geodaniel' name badge. If you look back at the OpenStreetMap diary entries, the vast majority of them make reference to a place the poster has been mapping, but there was no way of actually specifying the location of that place. Now, if you're writing an entry in your OpenStreetMap diary (as any OSM user can) you can also specify a location for that entry. When people view the diary entry they can now click through to view or edit that area of the map to see what you're writing about. Each pair of coordinates is wrapped in the geo microformat too, so if your browser knows how to handle them, it should be able to pick them out. The feed of diary entries also includes the location information (currently only W3C geo, but should soon have actual GeoRSS too), allowing you to visualise them on Google Maps, for example, or any other geo-enabled feed reader.